Having a car that stops when you expect it to can be a real-life saver literally. In some occasions, the reason for your braking system not working correctly is your brake pads, and these can have problems associated with them from a couple of different areas. Before you look at the issues, it is worth noting the symptoms which lead to you know you have a potential problem with your brake pads. Age – if it has been over 12 months or you have driven over 12000 miles you should have your brake pads checked. In with this is the recommended time the manufacturer recommends for your brake fluid levels to be changed. Warning Light – on the dashboard there is a small light which indicates your brakes are close to requiring a change, if this has been on for a while you can find that your brakes have worn down to the metal and you could have a costlier repair with the rotors. Indicators of this are if you hear squealing or grinding when you place your foot on the brake pedal. Pedal travel – once you push you to foot on the brake pedal, the distance traveled is much further than normal, this is a good indicator your brakes are worn as they are further away from the rotor and will not stop your vehicle in time. If you find your foot goes directly to the floor, this means you have no brake effectiveness at all, and it is advisable to call Las Vegas Mobile Mechanic immediately without driving any further. If this happens, you require Brake Pads Repair Las Vegas Mobile Mechanic can quickly fix this as brake pads can be quite an easy change to make. All we require is your car details; make model and year in most cases, so we can have you on the road and being able to stop safely within no time rather than you driving and putting yourself at risk of injury. 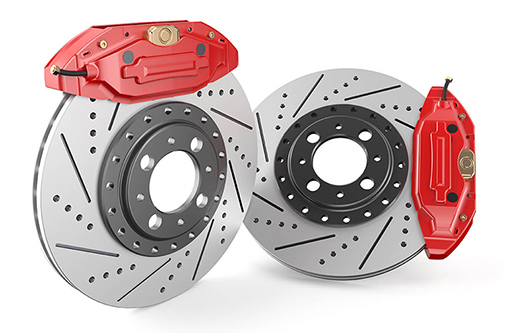 If you have any concerns about the condition of your brake pads, we can quickly come to your location and give your full braking system a quick check to find the condition it is in and when it is likely that you will need some work carried out to put it right. During this brake system check, we will measure all the brake pads and check their condition along with the status and wear of your rotors. If the vehicle is only fitted with rotors on the front wheels and drums on the rear which was more common on older models, the drums will be checked against wear as the other components. We will also check the condition and levels of all braking fluids and check the status of your parking break. Many Brake Pads Repair Las Vegas Mobile Mechanic can be the installation of new brake pads or shoes, fluid top up or change with brake bleeding. The replacement of hoses or seals around the brake cylinders or the resurfacing of the rotors, although we would personally recommend against this, as it leaves the rotors thinner and not as strong as they should be.